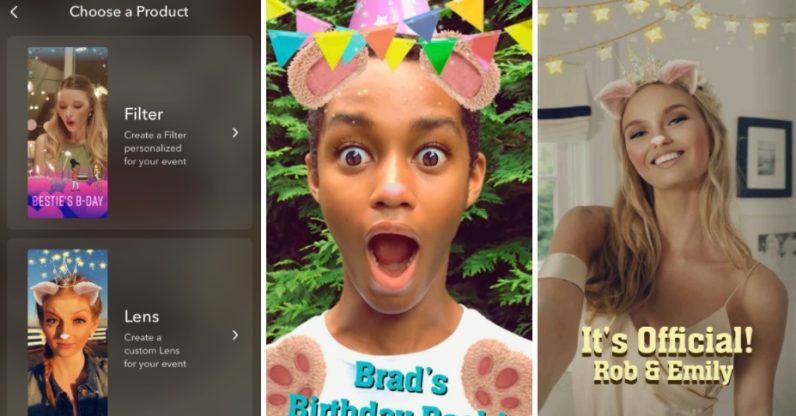 Today Snapchat announced it was opening its Studio to allow anyone to make their own event-specific face Lenses. Now you too can have the bunny-eared puking rainbow voice changer of your choice for your wedding or birthday party. The custom Lenses you can choose from a series of pre-made templates upon which to build the Lens — 150 of which will be available at launch — or upload a face image to use. From there, you add text, and you’ve got your Lens. You won’t be able to keep the creation permanently, however. As part of the creation, you have to enter a time and place for the Lens to be active, meaning it’s best suited for events with set dates. After that, they disappear. Also, they aren’t free. Snapchat prices custom Lenses based on location size and duration, with the minimum payment being $9.99. Snapchat’s face Lenses are probably its most memorable augmented reality feature — the lolling dog tongues, flower crowns, and face swaps are more distinctive than anything else Snapchat’s come up with since its invention. Offering users the chance to make their own feels more special than Geofilters, which has been the app’s only custom option for a while. Snapchat already opened its Lenses to the creativity of the masses last year with Lens Studio. That allowed everyone to make the dancing hotdog of their dreams. Currently, the feature is available on desktop and iOS for US users, with Android and the rest of the world soon to follow. Anyone who wants to make one, visit Snapchat’s website or the “Filters and Lenses” option in the iOS apps settings menu.